King of the United Kingdom and Emperor of India from January to December 1936 and Later Duke of Windsor. Photograph, signed and dated by Edward, 1915. The then Prince of Wales, looking much younger than his 21 years is shown in vignette head and shoulders in the uniform of the Grenadier Guards. The photograph is by the Court Photographer, Speaight of 157 New Bond Street, London and bears his impressed blind stamp at bottom left corner. The photographer has also signed his name in pencil in minute writing at the lower right corner of the image. Photograph measures approx 9.5 x 6.5 inches. It has some indentation/slight creasing to edges where it had previously been mounted in a frame and two small pinholes at top edge and bottom left corner. It is otherwise in very fine condition. The future Edward VIII had been invested as Prince of Wales in 1911. 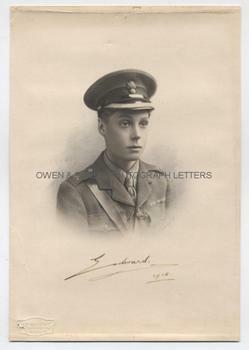 When World War I broke out in 1914, Edward had reached the minimum age for active service and was very keen to participate. Lloyd George prohibited his involvement for fear that he might be captured by the Germans but, nevertheless, Edward was a frequent visitor to the Front and witnessed trench warfare at first hand.